Using the ADDIE instructional design model and Universal Design, I create curriculum maps, design plans, syllabi, information architectures, storyboards, scripts, assessments, and in comply with ADA Guidelines. I develop web-based and instructor-led course materials for corporate training opportunities. I was responsible for the instructional integrity of courseware and the selection and successful application of appropriate instructional strategies. I also ensured the successful attainment of instructional goals and their learning objectives. Plan and conduct faculty development opportunities on various teaching and learning topics. Research, evaluate and apply appropriate instructional and inquiry methods. Collaborate with faculty to develop and evaluate case-based learning materials. Communicate with Teaching With Cases project team. Conduct educational research, write manuscripts and reports for university personnel and peer-reviewed publications. Identify funding opportunities and assist in writing grant applications. Manage department website and various media resources. Initiate, coordinate, and support programs that assist faculty to advance excellence in teaching and learning. Design and implement seminars focusing on professional development activities for new faculty. Develop and facilitate faculty workshops on Universal Design for Learning, course management, and other related, pedagogically sound course enhancements. Design and facilitate a faculty-mentoring program. Project manage a team in the development of an Instructional Materials Accessibility Plan, a campus-wide initiative to make all instructional materials ADA compliant by 2012. Instruct classes on digital skills for educators. Primary responsibility for the management of resources, staff, and budget for the CTL. Work closely with IT to embed instructional technology practices into infrastructure considerations. Conduct student focus groups to collect and analyze course effectiveness feedback. Administrated curriculum development, accreditation, and the departmental budget in a start-up operation. Directed recruitment, selection, supervision, development, & evaluation of faculty in the multimedia department. Instructed multimedia & web design applications classes. An historic and family-owned manufacturing facility capable of processing garment leather with $3M in annual sales. Led executive operations with up to 125 employees at peak periods, including accounting, projections, inventory tracking, and human resources. Assessed and met the needs of 7-9th grade students in need of reading assistance. Courses build students' competencies in the areas of new media, knowledge creation and collaboration, and emerging technologies. In addition, students receive increased training in conducting formal research and evaluation. Courses prepare students for leadership positions in government, social service, health-related fields, corporate training, and development of educational media products. Students in the program can alternatively create a general program of study on issues of educational theory and practice tailored to their specific background and career goals. Courses promote the development and application of scientific knowledge through high-quality, innovative research and scholarship as well as to prepare effective and culturally competent teachers, scholars, and community leaders. Evaluation consultant, professional development specialist, and instructional designer with administrative experience in public and private, academic and corporate enterprises. Ambrosino, R. & Peel, J. (2011). Faculty development programs: Measuring the impact on instructional practices, and student learning and motivation. Journal of Faculty Development. Souza, T., Carey, T., McMartin, F., Ambrosino, R., Grimes, J. (2011). Using multimedia case stories of exemplary teaching for faculty development. In J.E. Mill & J.E. Groccia (Eds. ), To Improve the Academy, v29 (pp. 60-73). San Francisco: Jossey-Bass. Ambrosino, R. (2009). Mentors as fellow travelers on the road to a successful university career. The Adult Learning Quarterly, American Association for Adult and Continuing Education, 20(1-2), 32-34. Peel, J. & Ambrosino, R. (2011). FOOD for Thought: Fast, Online, On-Demand Professional Development. Accepted for presentation at Accreditation Council for Graduate Medical Education (ACGME) Conference. Nashville, TN. Ambrosino, R. and Peel, J. (2010). Faculty Development Programs: Assessing the Impact on Instructional Practices, Student Learning, and Motivation. Accepted for presentation at Innovations in Education President’s Reception, UT Health ScienceCenter, San Antonio, TX. Souza, T., Ambrosino, R., Grimes, J., McMartin, F. (2009). Using Multimedia Cases to Change Pedagogical Strategies through Faculty Development. Accepted for presentation at Professional and Organizational Development Network (POD) Conference. Houston, TX. McMartin, F., Ambrosino, R., Grimes, J., Dosanjh Zucker, K. (2009). ELIXR: Using Web-based, Media Rich, Case Stories to Encourage Innovation in Teaching. Accepted for presentation at 9th Annual International MERLOT Conference. San Jose, CA. Ambrosino, R. & Piernik-Yoder, B. (2009). Building Faculty Learning Communities at a Health Science Center: A Practical Guide to Winning Support, Organizing for Change, and Implementing Programs. Accepted for presentation at Texas Faculty Development Network Summer Conference. Houston, TX. Ambrosino, R. (2008). An Action Plan to Adapt Faculty Development Programs to Meet Diverse Campus Needs. Accepted for presentation at Association of American Colleges and Universities (AACU) Conference. Long Beach, CA. There is an increasing interest in examining the impact of Continuing Medical Education (CME) activities on clinical practices and patient outcomes. 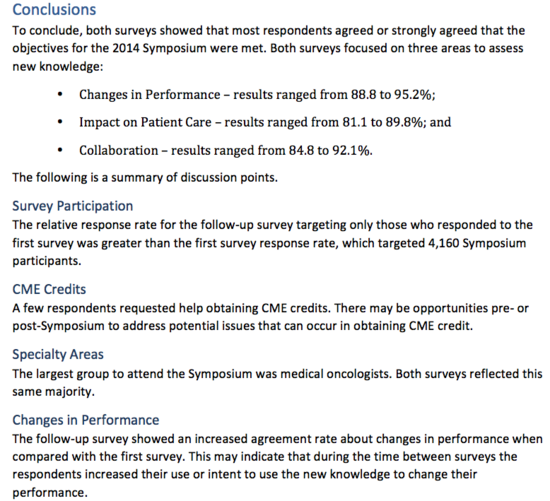 Walsh (2014) tells us that the industry is moving away from a perception of CME as a method of “accumulating credits for its own sake.” This report describes and compares data from two surveys sent to Symposium participants to identify the impact of new knowledge obtained during the Symposium. We build courseware that includes content pages, text, graphics, and perhaps simple audio and/or video, and assessments if desired. 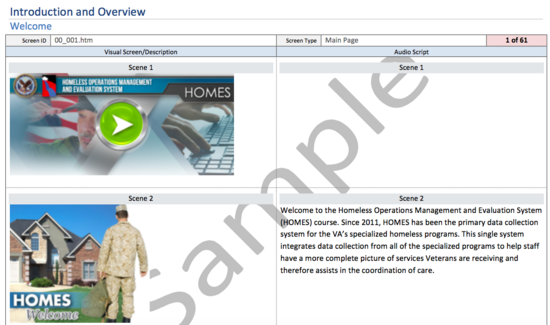 An instructional designer creates a storyboard to organize and display all the elements for review by the design team and the client can review the materials. Decisions can be made at this stage without the expense of undoing media development. This sample is taken from a full course, but exhibits only the introduction and the first chapter. Demonstrating the impact of faculty development programs is difficult and infrequently attempted beyond measuring participant satisfaction. This video examines how faculty development programs affect instructional practices and the impact on student learning and motivation. Page 1 of a 99 page course includes a media player for audio with closed captioning and scrub. How can an instructor ask the class a question and keep everyone in the class engaged? Sometimes one person can dominate the discussion. Other times the instructor resorts to calling on people. Audience Responses Systems allow instructors to engage the whole class, work in small groups, with non-restricted responses. The responses show the instructor in a glance who understands the material and who does not. Students become engaged with course content when it is presented as a case story. Case stories provide a platform by which to challenge students with materials that are realistic and relevant to students' career goals. Often, instructors enlist the help of instructional designers to build web-based learning objects that are media-rich, user-friendly, and instructionally effective. This case story contains pre- and post-knowledge surveys, comprehension checks, and graphic images straight from the clinical laboratory. The instructor may use the case to stimulate discussion as an in-class exercise or as an asynchronous activity. Fast Online On-demand Development. 5-minute module. Converted Powerpoint with audio, closed captions, and assessment tools. Director, Academic Center for Excellence in Teaching. Supervisor.